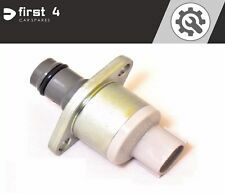 VW AUDI SKODA SEAT SAAB VAUXHALL OPEL FIAT 4.0bar FUEL PRESSURE REGULATOR UK! OE Numbers VOLVO 8634582. VOLVO 30750283. VOLVO 20799064. SUZUKI 15712M86J00. SUZUKI 15313-67G00. SAAB 9128304. ROVER LR032818. Citroen Berlingo 1.6 HDI 2002 - present. Citroen C2 1.6 HDI 80kW 2005 - present. Citroen C3, C3 Picasso 1.6 HDI 2002 - present. Citroen C4, C4 Picasso, C4 Grand Picasso 1.6 HDI 2002 - present. Citroen C5 1.6 HDI 80kW 2002 - present. 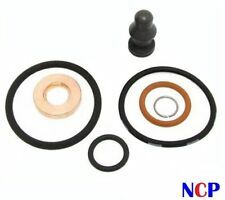 1 X INJECTOR SEAL KIT. Ford C-MAX 1.6 TDCi 66kW 74kW 80kW 2007-2010. Ford Focus C-MAX 1.6 TDCi 66kW 80kW 2003-2007. Ford Fiesta 1.6 TDCi 55kW 66kW 70kW 2002-2012. Ford Fusion 1.6 TDCi 66kW 2004-2012. NEW SET OF 4 INJECTOR SEAL KIT AS PICTURED. Ford C-MAX 1.6 TDCi 66kW 74kW 80kW 2007-2010. Ford Focus C-MAX 1.6 TDCi 66kW 80kW 2003-2007. Ford Fiesta 1.6 TDCi 55kW 66kW 70kW 2002-2012. Ford Fusion 1.6 TDCi 66kW 2004-2012. Citroen Berlingo 1.6 HDI 2002 - present. Fuel Injector Seals. Citroen Relay 2.2 2006 - Onward. Peugeot Boxer 2.2 2006 - Onward. Fiat Ducato 2.2 2006 - Onward. Hyundai Tiburon 2006-2008 2.7L. Hyundai Tiburon 2003-2008 2.0L. Hyundai Elantra 2000-2006 2.0L. Kia Spectra 2004-2009 2.0L. 1x Fuel Pressure Regulator. Kia Spectra5 2005-2009 2.0L. Whatever the problem, we will stay with it until it is resolved and you are satisfied. PART NUMBER: 198196, 1982F7, 0348T8, 1148106, 1348625, 1204698. For petrol models. Part compatibility provided for reference only. ✔︎ QUALITY PRODUCTS AT REASONABLE PRICE. ⚑︎ NEWEST PRODUCTS. FORDBA 9C968 B. Need help?. SKODA078 133 534 C. BENTLEY078 133 534 C.
Volvo C30 1.6 D 80kW 2006 - 2012. Volvo V50 1.6 D 81kW 2005 - 2011. Volvo S40 MKII 1.6 D 81kW 2005 - 2012. Volvo S80 MKII 1.6 D Drive 80kW 2006 - present. NEW SET OF 4 INJECTOR SEAL KIT AS PICTURED. Volvo V70 MKIII 1.6 D 80kW 2009 - 2011. INJECTOR SPILL RAIL BANJO BOLT. LAND ROVER DEFENDER 110, 130. We are happy to help you. Parts colour may very due to manufacture production. PICTURES AND PART NUMBERS ARE FOR REFERENCE ONLY AND DO NOT IMPLY THE MANUFACTURER. LR RANGE ROVER CLASSIC 1992 - 1994. INJECTOR PIPE NO 4. We are happy to help you. Parts colour may very due to manufacture production. PICTURES AND PART NUMBERS ARE FOR REFERENCE ONLY AND DO NOT IMPLY THE MANUFACTURER. 4X Fuel Injector Copper Washers. Quantity: 4X Fuel Injector Copper Washers. 1007, 206, 207, 307, 308, 3008, 407, 508, 5008, Partner, Expert. OE EQ number: 198185. JETTA / BORA 1999-2005 1.8T. PASSAT 1997-2005 1.8T. A3 1997-2003 1.8T. A6 1998-2005 1.8T. TT 1999-2006 1.8T. A4 1995-2008 1.8T. POLO 2005-2010 1.8T. VW GOLF 1998-2006 1.8T. 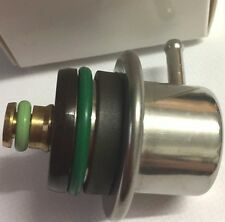 Fuel Pressure Regulator forCITROËN 1.4 1.6 1.8 engines needing more fuel. Will fit XANTIA XM BERLINGO C2 SAXO VTS models. New Fuel Pressure Regulator 3.0 Bar. Supported models. 1007, 107, 206, 207, 307, Bipper. 4X Fuel Injector Copper Washers. Quantity: 4X Fuel Injector Copper Washers. Reference OE numbers: 198143 / 198192 / 198196. Fuel Pressure Regulator forPEUGEOT 106 GTI 1.4 1.6 8v RALLYE XSI engines needing more fuel. New Fuel Pressure Regulator 3.0 Bar. Supported models. JETTA / BORA 1999-2005 1.8T. PASSAT 1997-2005 1.8T. A3 1997-2003 1.8T. TT 1999-2006 1.8T. A6 1998-2005 1.8T. A4 1995-2008 1.8T. GOLF 1998-2006 1.8T. Citroen Xsara Picasso 1.6 HDI 66kW and 80kW 2002 - present. Citroen C4, C4 Picasso, C4 Grand Picasso 1.6 HDI 2002 - present. Citroen C2 1.6 HDI 80kW 2005 - present. Citroen Berlingo 1.6 HDI 2002 - present. Mazda 3 1.6 DI Turbo 80kW 2004 - 2009. NEW SET OF 4 INJECTOR SEAL KIT AS PICTURED. Peugeot Partner (inc. Tepee) 1.6 HDI 2004 - present. Ford Focus MKII (inc. Turier MKII)1.6 TDCi66kW 74kW 80kW 2004-2012. Volvo S80 MKII 1.6 D Drive 80kW 2006 - present. NEW SET OF 4 INJECTOR SEAL KIT AS PICTURED. Volvo C30 1.6 D 80kW 2006 - 2012. Volvo S40 MKII 1.6 D 81kW 2005 - 2012. Volvo V50 1.6 D 81kW 2005 - 2011. Volvo V70 MKIII 1.6 D 80kW 2009 - 2011. Volvo C30 1.6 D 80kW 2006 - 2012. 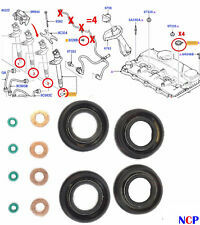 NEW SET OF 4 INJECTOR SEAL KIT AS PICTURED. Volvo S80 MKII 1.6 D Drive 80kW 2006 - present. Volvo S40 MKII 1.6 D 81kW 2005 - 2012. Volvo V50 1.6 D 81kW 2005 - 2011. Volvo V70 MKIII 1.6 D 80kW 2009 - 2011. MINI R56 Cooper D 1.6 D 2006 - 2010. MINI R56 One D 1.6 D 2009 - 2010. MINI Clubman R55 Cooper D 1.6 D 2007 - 2010. NEW SET OF 4 INJECTOR SEAL KIT AS PICTURED. Peugeot Partner (inc. Tepee) 1.6 HDI 2004 - present. Volvo S40 MKII 1.6 D 81kW 2005 - 2012. NEW SET OF 4 INJECTOR SEAL KIT AS PICTURED. Volvo C30 1.6 D 80kW 2006 - 2012. Volvo V50 1.6 D 81kW 2005 - 2011. Volvo S80 MKII 1.6 D Drive 80kW 2006 - present. Volvo V70 MKIII 1.6 D 80kW 2009 - 2011. Fuel Pressure Regulator forCITROËN 2.0 3.0 TURBO engines needing more fuel. 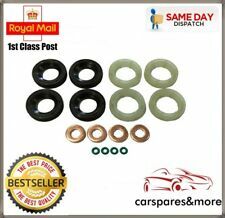 Will fit XANTIA XM BERLINGO C2 SAXO models. New Fuel Pressure Regulator 3.0 Bar. Supported models.